Just as it was important to assess soil characteristics to determine the basic design of the irrigation system, it is equally important to assess these same characteristics if effective irrigation scheduling is to be the result. To better understand this, you must first look at the various soils and see the differences in the color, slope and in the way it feels when the soil is either wet or dry. If you have dug a trench or observed the soil along the road right-of-way, you may have seen what appeared to be layers of soil. These observations can be related to a specific reason, and do indeed exert a significant influence on water holding capacity, availability and intake rates which affect irrigation scheduling. The soil profile or the root zone, is generally composed of three different layers of soil. These layers may be called top soil, subsoil, and parent material. In that the upper level which is generally referred to as the top soil is the area where the greatest amount of activity occurs. 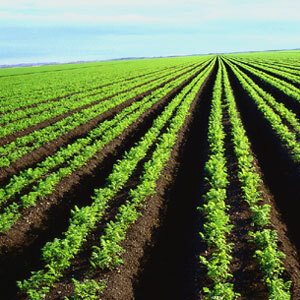 This is the portion of soil that is most developed in regard to tilth and fertility. This can be illustrated by observing what happens when deep plowing deposits the subsoil on top and then by observing the yield response. It takes time to bring the new top soil to a highly productive state. Different percentages of sand, silt and clay will comprise any soil. Sandy soils: Coarse-textured (sands and loamy sands). Loamy soils: Moderately coarse-textured (sandy loam and fine sandy loam), medium-textured (very fine sandy loam, loam, silt loam and silt) and moderately fine-textured (clay loam, sandy clay loam and silty clay loam). Clayey soils: Fine-textured (sandy clay, silty clay and clay). Each of the major soil textural classifications possess characteristics identifiable by “feel”. For example, you can place a small amount of soil in the palm of your hand and while rubbing a sample between the thumb and palm detect certain characteristics. Sand will feel gritty and individual particles can be seen. The particles will be rough and feel much like sand paper. Silt particles are smooth and will feel like face powder. Silt particles will be slightly sticky and plastic enough to hold its shape when wet. Clay size particles will feel slick and sticky when wet and a person will be unable to see the individual clay size particles with the naked eye. Very simple, soil texture refers to the size of the individual soil particle. The arrangement of the individual soil particles into groups, clusters or aggregates determines a soil’s structure. A different structure results when the soil is dried, frozen, thawed, by the penetration of roots and with the action of organic and inorganic substances within the soil itself. Some examples of soil structure are defined as: granular, blocky prismatic and platy. A specific structure depends on the manner in which granules may function as one in some soils. With sand, a single grain may be the basic structure, or it may be held together loosely by other substances. Soil structure affects intake rate, permeability, water holding capacity and availability per foot of profile. There will be a smaller percentage of pore space in the sandy soils than in the loams and clays. In the finer textured soils, when clusters or groups of particles function as one, pore space is increased which means improved water permeability. Soil structure will break down with excessive water movement, excessive tillage or plowing when it is too wet. This action may cause the soil surface to seal, reducing the infiltration rates and affecting water availability per foot of profile.